Malta has bucked the trend of its EU Mediterranean neighbours in many ways. This smallest of EU states barely dipped into recession during the global financial crisis and remains a stable member of the Eurozone whilst also having one of the lowest infringement rates and highest transposition of EU law records amongst the 28 member states. 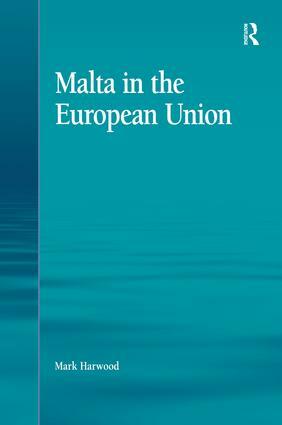 Providing the first comprehensive study of Malta's complex road to EU membership this book looks at the impact of membership on the country's political structures and processes and explains the principal factors that have conditioned the country's Europeanization experience. Reflecting Malta's unique and often contentious road to membership, the book explores the historical context and outlines how Maltese processes and policies have changed since membership and whether a causative link exists between these changes and Malta's membership of the EU. A wide range of primary and secondary sources facilitate the study complemented by a series of interviews with a broad range of Malta's political and social actors as well as individuals from EU institutions. This depth of analysis enables a holistic view of Malta's first decade of EU membership and helps establish the fundamental characteristics of Malta's unique Europeanization experience. Dr Mark Harwood is a Senior Lecturer in European Studies at the University of Malta. Previously he was employed with the European Commission as well as the Maltese Public Service. Dr Harwood teaches courses at both undergraduate and postgraduate levels, focusing on European comparative politics, EU politics, Malta-EU relations and the EU and lobbying.